Seasonal food for winter is so different from all the other seasonal foods. It’s the time of year when everything seems to be slower and when cooking can be a great source of comfort from the dark, cold evenings. Nothing beats the ‘winter den’ warming smells of a meal that is bubbling away in the oven as we get on with other things.Despite the French title of this dish it is really just a simple, but special, meal of braised beef. 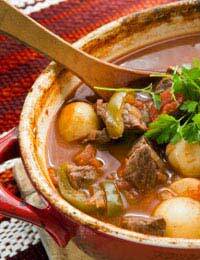 The French culinary term ‘daube’ comes from ‘daubiere’ and describes a braising method of slow-cooking meat in a covered dish. Here we investigate both the basic (without marinade) and the more elaborate versions of daube de boeuf; so you can decide for yourself which one most appeals. If you prefer to marinade the meat, then first trim excess fat and cut the beef into 2.5cm cubes. Remove the rind from your bacon and dice it. Place the cubed beef and diced bacon together in a bowl and pour the red wine over the meat.Cover with a cloth or cling film and leave to marinade for about 3 hours in a cool place, or 6 hours in the fridge. Alternatively, marinade overnight prior to cooking-this is especially good if you are using the cheaper cuts of beef. Peel and slice the onions (small shallots can be left whole) and carrots. Melt the butter in a heavy-based frying pan, then, lift the beef and bacon from the marinade and fry in the butter until they are nicely browned. Remove the beef and bacon once evenly browned. Next, fry the onions and carrots in the same butter with the crushed garlic. Transfer half of the vegetables to a large casserole dish. Place the beef, bacon and remaining vegetables on top. Add the chopped herbs, salt and pepper according to taste and then add the red wine from the marinade bowl. Slosh some of the beef stock into the frying pan and stir with a wooden spatula to loosen all the yummy bits in the bottom of the pan. Add the rest of the stock and bring to the boil. Next, add the tomato puree and stir thoroughly to blend it with the stock. Pour this liquid over the beef mixture in your casserole dish and cover with a lid or foil. The dish is now ready to be cooked. Cook in the centre of the oven for 2-3 hours (depending on the type of meat). Taste a little of the juice before serving to check seasoning. The flavours in this slow-cooked dish are so good it is best served with plain and simple accompaniments, such as creamy mashed potato and seasonal green vegetables. For an unusual finishing flourish to make this dish even more extraordinary, why not try the following addition? When the beef has been cooked for two and a half hours, as described, remove it from the oven and allow it to cool. Then, skim off any fat residue on the surface. Use a kitchen fork to mash the (drained) anchovies, capers and garlic together in a bowl. Gradually add the remaining ingredients and 2tbsp oil from the anchovy can. Spoon this mixture into the beef dish and stir in well. Baste the meat with the sauce several times before you replace the lid and put the dish back in the oven for a further hour. Check that the meat is tender before serving, with creamed mash as before, buttered noodles or plain boiled rice.